Walt Whitman, after his first reading of Ralph Waldo Emerson's essay, "The Poet," said, "I was simmering, simmering, simmering; Emerson brought me to a boil." Talk about getting your vibe on! We have to ask ourselves, What gets my spirit boiling? In other words, what awakens and stokes your spirit? We are beings of passion. We feel, and we feel deeply. When something profound moves us, we spring into action the way Uncle Walt did after connecting with Emerson's words. Whitman, as a result, went on to pen such timeless works as Leaves of Grass and other classics, revered today as great literature, divinely inspired no doubt. He reached a boiling point so personal and proactive that he could not contain his energy any longer. He had to do something about it. And he did. He burst like a bottle of bubbly on the literary scene. There was no holding him back. That's how Spirit works in our lives. It infuses us with an energy that impels us to act, to create, to share, and to live. That's the power of enthusiasm. 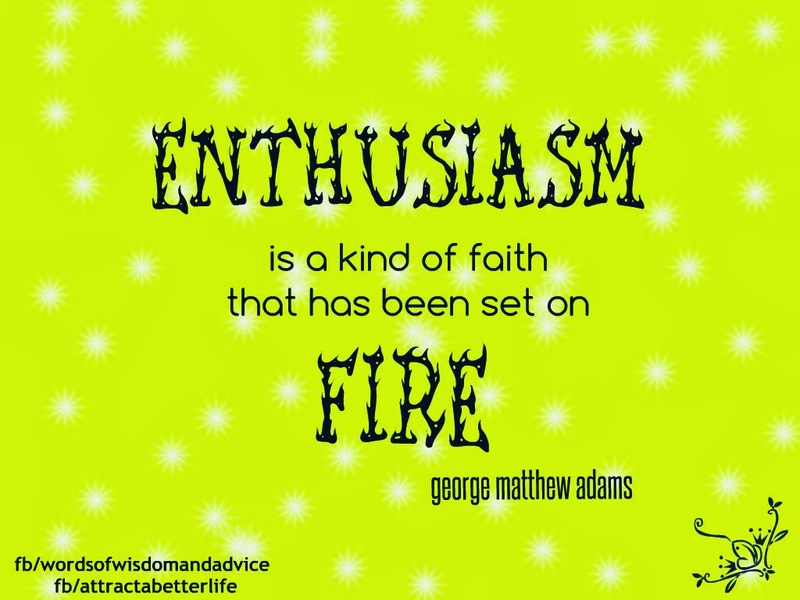 Enthusiasm is a spiritual quality that adds value to everything it touches. Whether it's writing, singing, painting, folding laundry, or raking leaves, it will take on new meaning. We can thank the ancient Greeks for such an explosive, powerful word. The root word of "enthusiasm" is "entheos," -- "en" meaning "in" and "theos" meaning God, -- literally "in God." Interestingly, the word "inspiration" means literally "to breathe in and be filled with the spirit of God." So, in essence, we are breathing in Spirit that compels us to begin anew in life as we advance toward embracing and expressing our productive, thriving, authentic, spiritual selves. When we are aligned with the energy of inspiration and enthusiasm, we find ourselves living and creating without effort. Whatever we never felt capable of doing suddenly becomes doable. What an amazing gift to us! Ask yourself again what generates enthusiasm in your life. What will bring you to your boiling point to make you feel most alive and on fire? Children are some of the most enthusiastic beings alive. Today, let the child within come out to play. What sorts of things excited you? Instead of thinking about them, go and do them. Spend time with children. Find a playground. Ride the merry-go-round. Saddle yourself in a swing and aim for the sky. Play to your heart's content. Let the child within talk with the adult you are. Let inspiration breathe life into you; let it restore you. Decide what you want to do in life, and go for it with such zeal and energy that everyone around you feels it. And as you get your vibe on, watch what happens. Things will appear that you never expected. And there will be no holding you back. 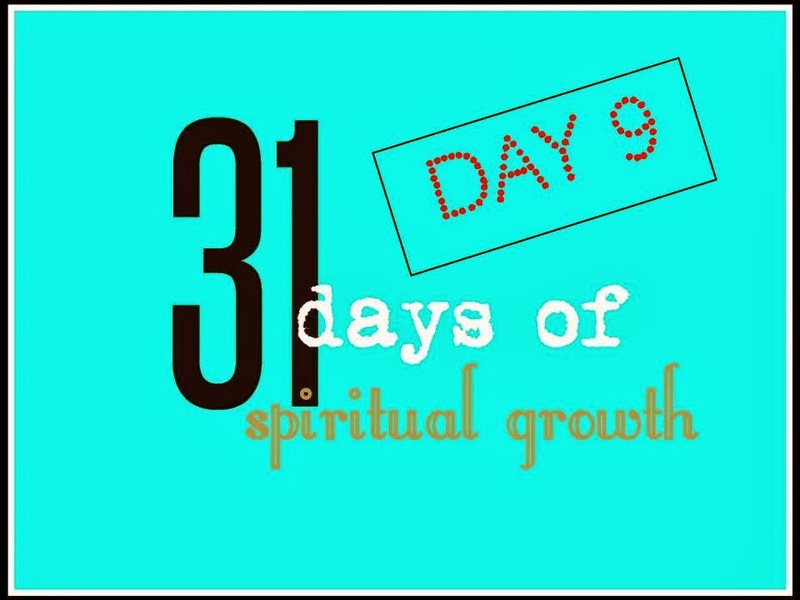 Read 31 Days of Spiritual Growth here, and find links to each post in this series. I learned that the word ‘human’ actually comes from a Sanskrit term meaning ‘the dispenser of divine gifts’. And that is what we are here to do — to draw these patterns of inspiration from the invisible and dispense them on earth. Michelangelo knew this when he created the David. He saw the completed masterpiece already in the block of marble and just chipped away. His inspiration is evidence that the bandwidth to our divine purpose is wide open! Wow, Gena, that's pretty fascinating about the etymology of the word "human." Pretty cool. I love learning the history of words. Our inspiration, then, is the Spirit working through us to dispense gifts out to others. Thank you for this enlightenment! Spirit transcends any religion, making the true church inside of each one of us. Now that you are aware, it's easier to take control of life to create it in the way YOU want to create it. How beautiful is that? When we align ourselves with positive energy of love, good things will attract themselves to us...and there will be no stopping us. As you know, I get VERY ENTHUSED about things!!! My Mom really loves seeing me do this. I've never met a stranger. I get into conversations with people every where. I find something to like in everyone I meet. I try to see the silver lining in all things and most of the time I succeed at it. It is really such a great way to live.....and it is contagious. I LOVE your enthusiasm...it is evident through everything that you write, so I can imagine what it must be like to be in your presence! :D (By the way, I saw the ServPro commercial last night on TV and thought of you, so I sent you love and gratitude!). I'm like you. I look for something to like in everyone I meet. People are beautiful creations, and since we are all creations of the Spirit, there are no strangers...we are all brothers and sisters...we just haven't met all of them yet! It's like being at a family reunion and meeting relatives for the first time...LOL. Your story made me laugh! I've had people tell me I'm too happy to be around, too. I respond with, "Guess you'll have to get used to it." Thanks so much for dropping in and sharing your thoughts! What a fantastic question "what gets your spirit boiling' I've long thought that we ought to look to our open and beautiful children to remember how to live and be awake...not just survive from day to day. I really connected with your post today. Loved it. I'm so glad you connected with my post. Looking to our children is a wonderful place to find inspiration as they remind us how to play and enjoy life wholeheartedly, and they know what it feels like to want to be seen for themselves and celebrated for their uniqueness...what a lesson they teach us! Here's to your spirit boiling over so much that your energy can no longer be contained! Sending you much love and blessings! Penny, Congratulations on a wonderful post. It's good to meet fellow lovers of words. Far more of a blessing is finding so much inspiration at a time when it is scarce in my life. The Lord truly leads us where we need to go. Yes, indeed, it is good to meet fellow lovers of words. What a gift and blessing to us! We are the mouthpieces for Spirit to dispense divine gifts, such as inspiration, to others. m suddenly overflowing with a sense of once again remembering, not only remembering but actually being totally inbibed with a complete knowing, of what I should be doing with my life. As I prepared for the talk, I was suddenly excited. I realized that I actually had something to say. I spoke about the fact that each of them is more important than they could possibly ever know. Just going about our daily lives and being our normal selves touches lives dramatically. I always use stories. One was my dad's recent funeral where we thought there might be 60 people. He was almost 88 and he had outlived most of his friends. There was standing room only in the church, over 120 people. Even the mail lady was there. The mail lady! What possible impact would a person have on their mail lady? I'm sure you've seen my story about the "One sentence." The ladies were deeply touched. Some crying, some tears welling up. Not about my dad, about the humbling thought that they matter so much. I know this is a long winded comment, but my joy is in helping people realize how very special and important their lives are. How blessed they are, how connected they are. I do that best in speaking. So now I will do it again. Thanks for your post today. It reinforced me. WOW, Dina, what a beautiful testimony of "How Dina Got Her Groove Back." This is wonderful! You are meant to touch lives, and Spirit led you back to using the gift you were created to use and share with others to inspire them in their lives. How awesome! Talk about being on fire! You are sizzling!! And what a beautiful story about your father's influence. We never know how far our influence will go, will we? I know when I was teaching, I did my best to help students see beyond themselves through literature, writing/journaling, and self-reflection. It's not until years later that I hear from them, thanking me for my influence in their lives. So, what you are doing is a beautiful thing, Dina! Keep doing what you are doing. There are people out there who need to hear your Voice. Much love and blessings to you, my friend! Such an inspiring post and exactly what I needed to read today ! I'm so glad my post inspired you! I know what you mean. Sometimes we get so busy doing things that we forget or neglect the things we once loved doing. It's a matter of balance.